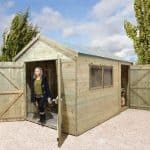 Keeping your items safely locked away from thieves and also protecting them from the weather is what the 6′ x 4′ Traditional Pent Security Shed is going to do for you. 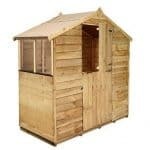 This is a fantastic, solid and cleverly designed shed that is all about keeping what is special to you safe. Things like the children’s bikes, electrical items or anything else that you have spent your hard earned money on is going to be securely locked away inside of here. With its small windows and incredible strong door which has a padlock protector, this is a shed which is not going to make it easy for a person to break into and it looks great while it is keeping your belongings safe. All of the materials of this shed have been selected because of the security they offer. Solid 12 mm thick, tongue and groove shiplap cladding is joined by an incredibly strong frame to ensure a very well put together structure that is going to offer you many years of service. The shed also has some very high quality boards making up the pent roof and for the flooring as well. In all this really is one of the strongest and most secure sheds you will ever see. 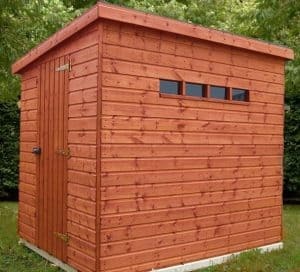 Here we have a shed that is all about offering you the maximum amount of security you can get with a wooden shed. Everything about this shed is aimed at keeping what you have inside safe from not just the weather, but from any potential thieves that may be around looking to steal your items. Things like expensive bikes, gardening equipment or anything else that you value will be kept safe inside of here. Speaking of inside, inside the shed you do actually have some reasonable storage space to make use of. The depth of the shed is 6 feet and the width 4 feet, we feel this is a good amount of room for the average sized garden and also the shed does not take up a whole lot of space once built. To make moving around inside easy the 6′ x 4′ Traditional Pent Security Shed at its highest point is over 6 feet tall and even the lowest point is right around 5 feet 7 inches. The pent roof is going to be able to make sure no water leaks inside and destroys your items. We love this style of roof as it really does do such a wonderful job at keeping out the rain. The roof has a high quality felt covering very strong 12 mm thick boards which are of the tongue and groove style to really make the roof nice and strong so that it can withstand the harshest weather. The 12 mm thick, tongue and groove shiplap cladding looks fantastic. We really love how great this shed looks and just from the pictures alone, you can tell that this shed was designed to look strong. And strong is exactly what this shed is, the 12 mm thick cladding is made from very top quality redwood and the design has clearly been done so that this looks like a shed which would be very hard to get into. The frame inside here is one of the strongest frames we have ever seen. We have looked at high priced summerhouses that do not have a frame as strong as the 44 mm x 27 mm frame that is in here. This is made from the same kind of wood as the rest of the structure and one thing that we really love about this frame is how the edges have been rounded. Make no mistake about it the frame is a huge reason as to why this shed has such a solid and high quality feel to it. The flooring is the same as what is under the roofing felt and that is 12 mm tongue and groove style boards which will allow you to place many heavy things inside of here. As well as this it makes moving around inside feel good as the floor is not buckling as you move. The floor that has been put inside here we feel would be able to handle pretty much anything you could want to put inside. The 6′ x 4′ Traditional Pent Security Shed will be given a base coat treatment before it is sent to your property. This is not meant to protect the shed in the long run, but make sure that it is protected in transit and during construction. To really look after this, you will need to give it a coating of wood treatment. 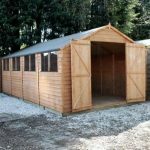 As is the case with other wooden sheds, you will want to treat the wood once a year to ensure the shed is with you for a very long time. This is one very durable and built to last kind of structure and to show how sure they are of it, it comes with a one year manufacturer’s warranty. The door on this shed is incredible strong and also a very good size to make getting in and out easy. The height of the door is, 5 feet 9 inches and the width is 2 feet 6 inches. This we feel is a very solid door that is held in place with three strong hinges to make the door never droop, sag or in general be any kind of hassle to close. Many sheds these days use just two hinges, but as security is what this is all about, we love how they have added three to keep the door securely in place. The windows on the shed are very interesting as along one side there is a row of small windows that are made from horticultural glass. This type of glass is very strong and despite their small size and rather high location on the side of the shed, the windows do let in some natural light, but at the same time these windows are designed so that a potential thief would have a very hard time looking inside of them. Security is what the 6′ x 4′ Traditional Pent Security Shed is all about. The overall build of the shed is very well done and designed to keep people out as well as the weather, but the door is where the real security is. We talked just before about how practical the door was, but it is the incredible amount of security it provides which makes this such a great shed. There is a space to put a padlock on the door, but it actually has a shielded padlock protector as well. So your padlock is even protected and would be hard for thieves to get to. Now at first this can be a bit awkward for even you to unlock, but once you get the hang of it we can assure you that you are going to love how securely locked up your shed is on a night. Your belongings are very safe in here and those windows make looking inside the shed very hard. There is no danger of a person walking past and being able to glance in the windows and then knowing what you have inside. 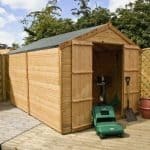 We feel that this type of shed is made to blend in and kind of go unnoticed and a way you can do that even more is by using a coloured wood treatment that will make it fit in with the rest of your garden even more. This is a really good way to give it your own bit of style as well as ensuring the wood is protected. While there is a padlock protector on the door the shed does not actually come with a padlock so that is something extra you will have to buy. Also if you are a bit concerned about the surface you are placing the shed on then you can buy some wooden floor bearers at a cost of £19.99. This shed is so well designed that there really is not one thing about this shed that makes us question its quality. 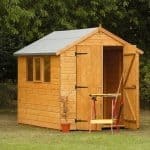 As long as you remember to treat it once a year, we see this shed being part of your garden for many years. While this is not a large sized shed, you can still make very good use of the space you have. Adding a couple of shelves inside here, we feel would be one way to really allow you to make smart use of the space. We do not see this causing you any major problems during constriction. It should take you and a friend just a couple of hours to build as long as you follow the instructions and are sure not to take too many tea breaks. We feel that they could have added another £50-£100 and we still would have said this is a shed that offers great value for money. Final Thoughts: While the 6' x 4' Traditional Pent Security Shed may not offer the largest storage space we have ever seen, we cannot understate just how much security this shed will provide you with. 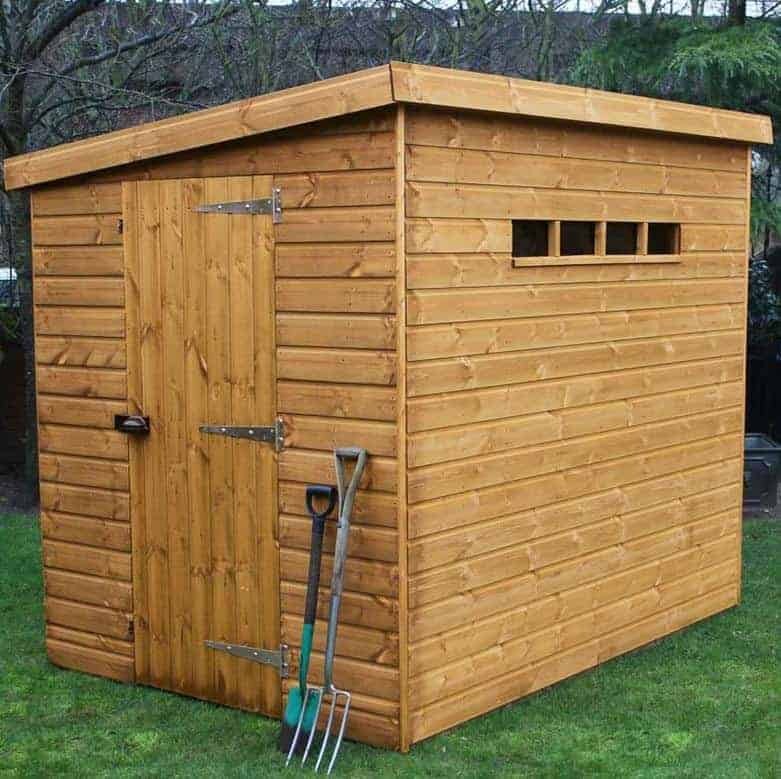 If you want to make sure things are not only kept tidy and safe from the rain, but also safe from anyone looking for things to steal then this is the shed for you. 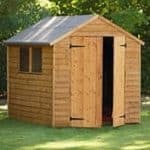 With how solid and practical it is, we do feel it is very easy to overlook what an attractive shed this is, but actually the overall design is fantastic and we are sure you will be just as happy with how this looks in your garden as you as the safety and storage it is providing you with.